Why yes, there is a whole month to celebrate pears! I may believe pears should be celebrated ALL year long, but I especially celebrate the bounty of pears in December when it is National Pear Month. 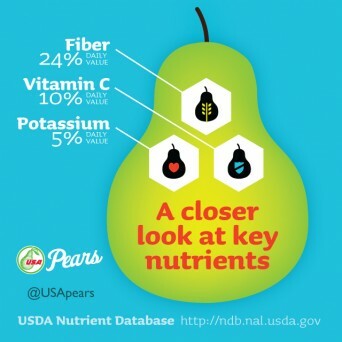 Fiber: A medium pear has 6 grams of fiber, which equals about 24 percent of the recommended daily value. Did you know that the skin contains the majority of the fiber found in a pear? Hypoallergenic: With an ever-growing population of food allergies, pears have been coined to be hypoallergenic. Safe food is good food! Pectin: Pectin is an essential water-soluble fiber that helps to bind to cholesterol and remove it from the body making pears an excellent addition to anyone with high cholesterol. Combining both the natural sweetness of pears, beets and sweet potatoes, with just a slight hint of ginger, look no further for a tasty dish. By the way, fresh ginger contains natural anti-inflammatory properties making it a perfect and delicious pear-ing. Time to put on that holiday red! Try this elegant appetizer to add some festive flair to your table. All 10 varieties of pears are in-season right now, so the time is ripe to be enjoying this delicious fruit. 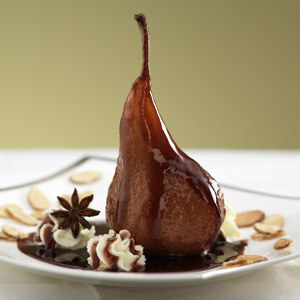 Pears can be found at grocers throughout the month of December! Above all, pear your food with the best company and music, and you will enjoy a rich and nutritious Pear Month! Make sure to use the hashtag #NationalPearMonth on social media and follow USA Pears on Facebook, Twitter and Instagram for all things pears! Kathy is known as Canada’s Leading Nutrition Expert, Canadian Holistic Nutritionist of the Year 2016 is a popular speaker, health and fitness presenter, and the go-to media expert in all things health and wellness expert with over 20 years experience in both the health and fitness sectors.